Chef Feroz Khan is a great carver and having exceptional talent in carving. He has proven his talent through his many outstanding carving design, carving display/setups, workshops and competition. Chef Feroz is a carver who created many designs using fruit and vegetable, soap and ice. It was during his job at Taj Hotel, Mumbai he met the traditional art of carving fruit and vegetables. Then he has concentrated more on his work, carving on all types of fruits and vegetables, ice and soap. He hence pursued full time degree course at Mumbai, Rizvi Hotel Management College of culinary, bakery and confectionary. He went on become a top student of his class. Over the years Chef Feroz had made spectacular carving decorations for special occasion, private parties, weddings, christenings, anniversaries and taught courses in Mumbai, Pune, Gujrat and many other cities in India. Chef Feroz teach in almost all colleges of hotel management in Mumbai, many IHM college throughout India, In many home science colleges, in Indian Navy INS Hamla Mumbai, and in many food related companies and take special workshop for kids and ladies. With constant practice and hard work, he has tried to develop different technique to teach his work. In the coming years Chef Feroz made various fruit and vegetable carving Display/setup based different Halloween themes. He also made carving setup with a blend of Indian traditional designs blended with fruit, vegetable and ice. The art of carving fruits and vegetables originated during the period Sukhothay in the 14th century in Thailand. The women of the royal house developed and perfected this art in honor of their monarchs. This traditional thai art of carving fruit and vegetables has been passed from generation to generation through this centuries. Sculpture in fruits and vegetables is considered one of the ten traditional arts crafts in Thailand. This form of art expression is much loved and admired in Thai culture. The tradition of carving fruits and vegetables spread across the globe and is now used as a display weddings, birthdays, christening and private parties as well as a unique gift for someone special. Some chefs utilize fruit carving as a culinary technique. Once fruit carvers have mastered the techniques past the intermediate stage and become professionals, they can price their services to restaurants, professional caterers, hotels and resorts. Professional fruit carvers can also create centerpieces and displays for various events, such as parties and wedding receptions. 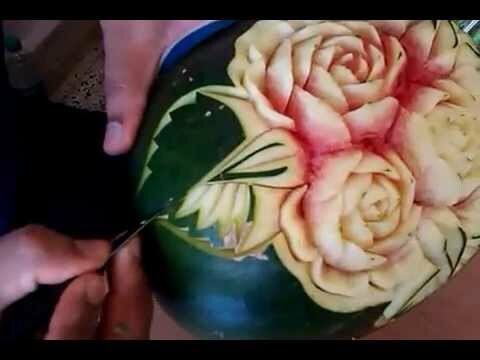 On a smaller scale, fruit carvers can present a dish with decorative garnishing to add an aesthetically pleasing experience to their viewers. 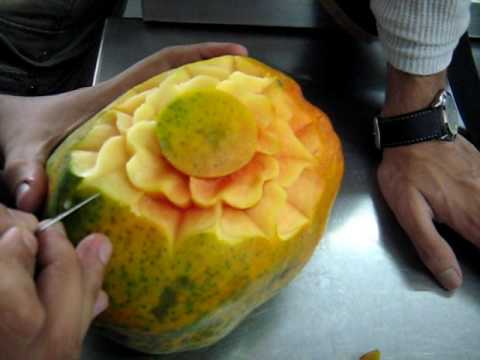 The art of fruit carving uses many different tools, usually ordinary items but some specific to just fruit carving. All these tools give the artwork a different texture or help with its design.